Lynne Bowland of Island Girl. "With fire, copper and melted glass Lynne has captured the carefree spirit of Van Gogh's painting. 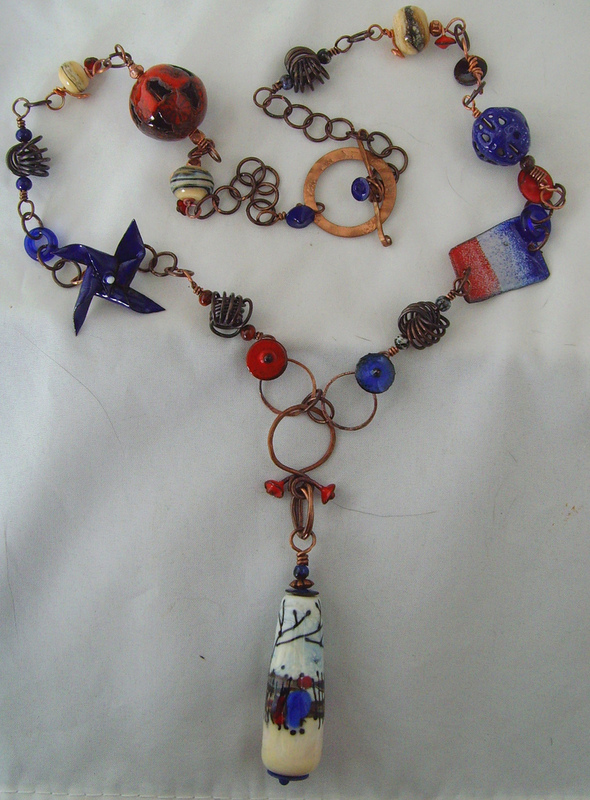 Not only did she create an amazing focal bead, she created almost every component on her necklace! I love the pinwheel and little flag. The headpins and chain are awesome and then I love how she clustered the jump rings together to create those funky textured beads. It's a great celebration of our French inspiration"
You can visit Lynne's website for more information about her work. There is still time to enter our March monthly challenge, check out the details here. Wow! A real tribute to the original artwork. Love the focal! Beautiful Lynne! That focal is fantastic. And I early like your bail solution too. Congratulations Lynne! I recognized those cute headpins right away. I have been a huge fan of Lynne's work for some time. What a fun piece! A wonderful showcase of her myriad talents, including lamp working and enamel! And such a fun interpretation of the challenge painting. Stunning and perfect for the inspiration piece! Love it! My eyes raced from place to place to appreciated all there is in this special necklace. Love the focal bead. She really managed to get all the elements in there. That focal alone is astounding! A masterpiece in itself! So glad to see Lynne's work this Monday. Fabulous work! So nice, Lynne! Your handmade enameled beads and headpins make this piece extra special! I am in awe! Beautiful piece! That is beautiful!! Awesome work! The focal bead is gorgeous. I would love to get one of this. I hope Lynne offers a good discount.